When you’re looking for convenient automotive collision repair and paintless dent repair at a reliable body shop in Wichita, Kansas, Eddy’s Body Shop is the right place to go! We’re proud to offer high quality auto body repair services to the Wichita area with convenient hours – Monday through Friday from 7:30 a.m. until 6:00 p.m. 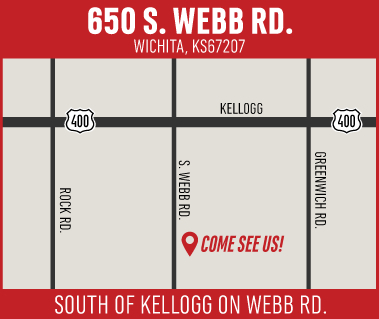 Whether you’re in need of collision repair, windshield replacement or any other body shop service, get directions to visit our location: 650 S Webb Rd, Wichita, KS 67207, it is worth the trip from Andover or Derby, KS! Give us a call at (316) 652-2135 with questions, for 24-hour towing service or to schedule an appointment at Eddy’s Body Shop! We even offer free loaner vehicles so you can stay on the move while we’re working on your vehicle. We look forward to serving you at either location of Eddy’s Body Shop today!